It’s a sensitive subject, but we think you need to hear about it. 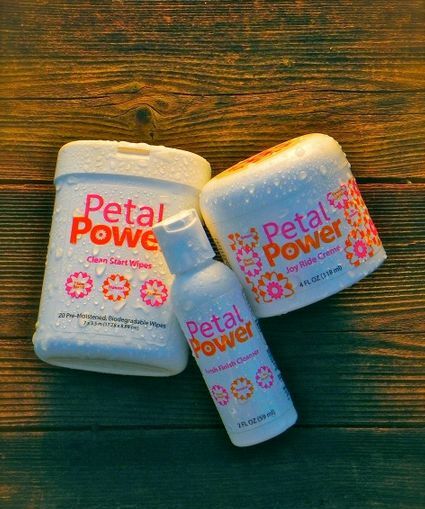 Our “lady parts” can take a beating on long rides, so our friends at Petal Power have something just for us. Their Joy Ride System is a 3 step system that takes care of our “petals” before, during, and after. First, their Clean Start Wipes are pre-moistened, biodegradable wipes that contain bioactive plant extracts with natural antibacterial and antiseptic properties that gently clean your delicate parts. Second, apply the Joy Ride Creme; a pleasing chamois cream with natural, plant-based ingredients that protect you from chaffing, irritation, and saddle sores. Third is their Fresh Finish Cleanser that gently cleanses with bacteria-fighting tea tree and lavender essential oils and cucumber and aloe extracts that soothe and moisturize. We found this 3 step system easy on our “petals” and a great way to keep us comfortable and happy on our long rides. A definite must for TrailblazerGirl riders!